In bringing us up on stage, Dr Brennan Spiegel, founder of the Virtual Medicine conference, expressed the importance he attached to the patient testimonials; he noted that the conference is held in the hospital in order to remind us of the mission of everyone in healthcare, which is to care for the patient, and that we must recognize the valuable contribution from the patients who step forward to tell their stories, no holds barred. DENISE SILBER INTRODUCING THE TOPIC. The entire conference was riveting, whether listening to the content on stage, making new contacts at the networking moments, experiencing the demos or walking through the Cedars Sinai building complex. “Mind- blowing” we said about the latest research on virtual reality in a variety of indications. “Mindblowing” we said about the creativity of the speaker presentations and videos. 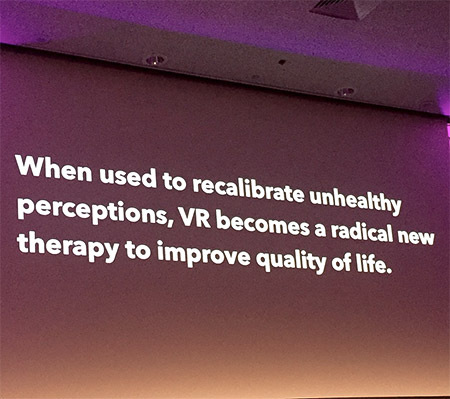 And VR works not only on the now classical indications, such as chronic pain, phobias, anxiety, depression, but also in ways we are only beginning to explore. This year, we heard about disembodiment, using virtual reality to have an out of body experience, either looking at oneself from the distance via one’s own avatar, or communicating with oneself via a second avatar, such as one of Dr Freud, pronouncing your own thoughts. Mindblowing! As the session moderator, I found that even mindblowing was not strong enough to express what we experienced, whether from the stage or in the audience. 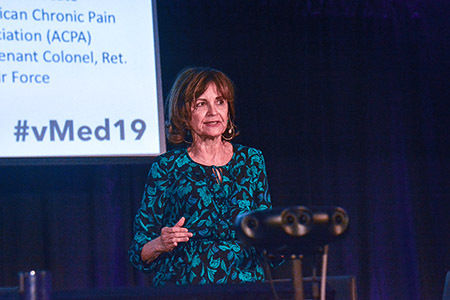 The audience was so attentive, you could have heard the proverbial (and or virtual;-)) pin drop, and of course we experienced the emotion and depth of feelings that only peer to peer communication with patients can elicit. We listened to the four uniquely human stories of Tom, Jason, Harmon, and Mark. Each was called upon to explain 1) how he had been introduced to virtual reality and 2) how this technology had worked for him. 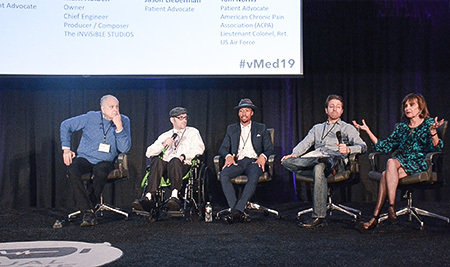 In all four cases, a physician who either worked on their case or who had heard about their situation, had offered these patients the possibility of trying virtual reality, and the VR programs were typically effective very quickly. VR made unwanted symptoms subside and even helped them reach a superior level of well-being. Tom Norris, a retired air force colonel with 23 years of public service, has extensive experience in trying to break the hold of extreme pain whether for himself or for other patients and patient groups he mentors. For Tom, VR was a logical next step, building on his experience with yoga breathing, an activity he had adopted from his literary hero, Nick Carter master spy. Tom first used VR with success on the pain and stress of four broken ribs. 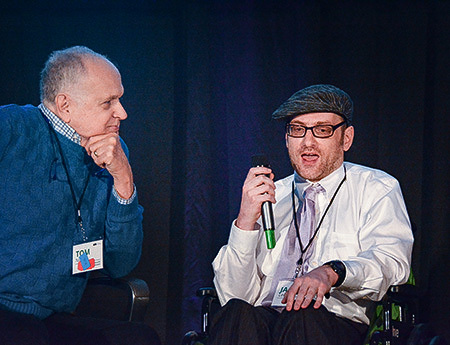 Jason Lieberman, a patient advocate in cerebral palsy, who traveled to LA from his home in NYC for the conference, also coaches other members of the cerebral palsy community through the situations he has experienced. For Jason, VR meant the possibility of regaining his autonomy. Prior to VR, Jason could not move and was forced to “stare at the four walls” most of the day at a rehabilitation center. He used virtual reality to relax muscle rigidity and got to go home to his family. 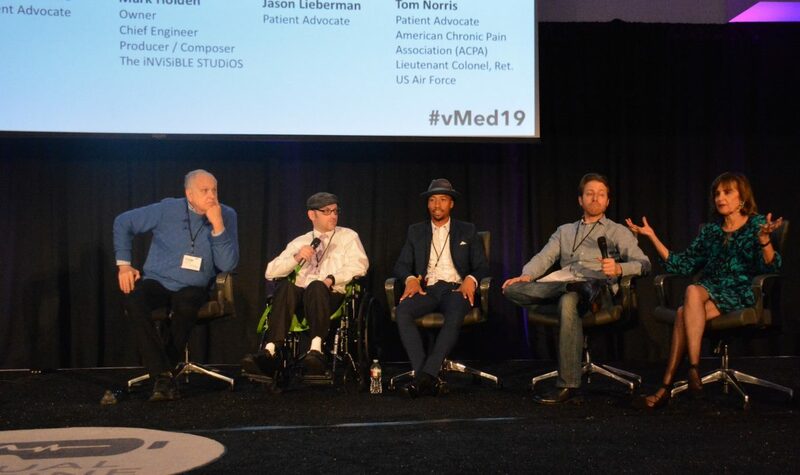 Harmon Clarke Jr was suffering from chronic, intermittent pain related to IBD, until VR came along and broke the cycle. Harmon told us that his condition is in fact his super power, because it has enabled him to rise up and see the beauty of the world. 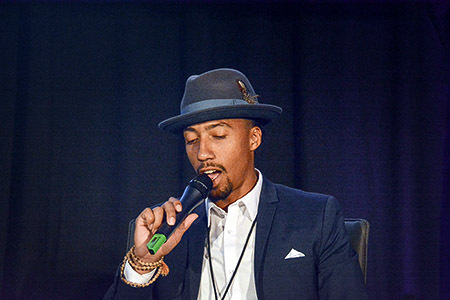 Harmon credits the experience from illness to wellness with the possibility of realizing his dream of becoming a performer both for traditional audiences and for the patient community. Mark Holden, had suffered multiple fractures of his tibia in an accident. He works in entertainment, and so the idea of using VR entertainment to separate himself from his pain is very appealing. His pain as well became bearable under the influence of virtual reality. What are some of the patients’ recommendations? Here are a few heartfelt practical suggestions from our session. For every problem, they saw the way to go about solving it! Timing: Improve on the entry and exit sequences of the VR programs. Don’t keep the nurses waiting at the beginning. Work on transitions. Don’t abruptly end the session for the patient. QC: Do good quality control to remove glitches, because they bring the pain back! Gamification: Provide opportunities to move to the next level through your efforts, the way games do. Consider the whole body: Try filming the patient’s body, while under Virtual Reality, to see how it is being impacted. Particularly important for cerebral palsy. Work on VR solutions for brainfog. Patient cooptation: Give patients the materials so they can show other patients how VR works. And, in conclusion, the quote below from Brennan Spiegel sums it all up quite nicely! 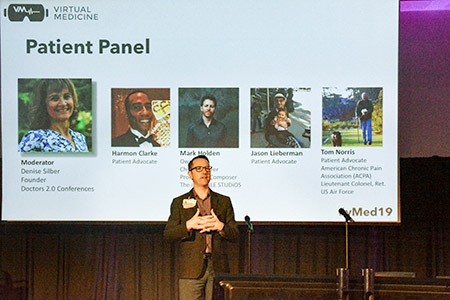 DR BRENNAN SPIEGEL – CEDARS SINAI, ANNOUNCING THE PATIENT PANEL AT VIRTUAL MEDICINE. PS Thank you to Dot Cannon for the photos! And for your article about the session. It is fantastic. Contact Denise Silber, founder of Doctors 2.0 & You, to discuss how you can make your next medical event more attractive to your attendees.